Like most kinds of chicken, the sauce and preparation dictates the drink pairing. Here are four ways to pair different types of chicken wings. Buffalo wings. The classic vinegary hot sauce is generally a disaster for wine. Instead, opt for beer—something with bitter flavors, like an IPA, works well to quell the heat and cleanse your palate of all that butter and blue cheese. Barbecued. Wings with a darker barbecue sauce, including this molasses one, is great with full-bodied, ripe-style reds, like Malbec or red Zinfandels. 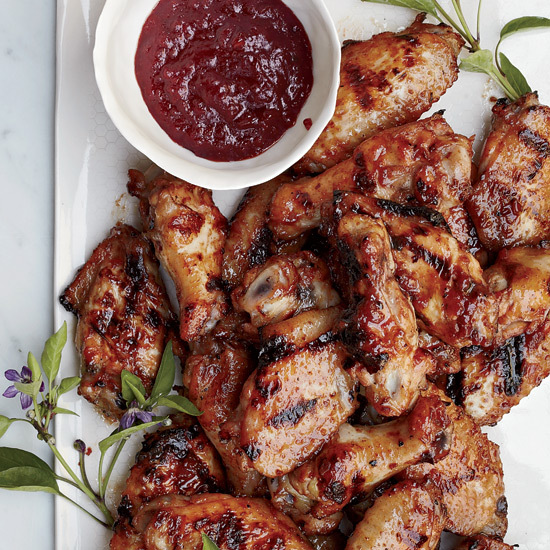 If the wings are both sweet and spicy, like these cherry-glazed wings, similar wines can work, but beer is usually better. German Doppelbocks are full-bodied with sweeter, roasty flavors that are nice with this style of chicken wing. Light fruity glaze. Even when they’re spicy, wings sticky with an orange or apricot glaze pair well with richer-style, slightly off-dry whites, like Chenin Blanc from France’s Loire Valley or Pinot Gris from Alsace in France or Oregon. These wines tend to have enough sweetness to match the glaze. If you’re thinking beer, wheat beer, with their sweet-spiced and citrusy flavors, are best. With Southeast Asian-style wings. Whether marinated with fish sauce or tossed with a Thai curry paste, Southeast Asian flavors tend to be great with off-dry Rieslings from Germany or New York’s Finger Lakes. The acidity in these wines acts like lime juice, which is always great with these funky flavors. Plus, the slight sweetness keeps the heat in check. For beer, opt for a snappy pilsner or other lighter beer, which is probably what you’d down if you were eating wings on the streets of Thailand.